There are wonderful countryside views and, on a clear day, the hills of Dartmoor can be seen to the south, and Exmoor to the north. Situated in the very heart of Devon, this relaxing, homely inn appeals to those who require peace and tranquility, and appreciate genuine warm hospitality and personal attention. Thelbridge is a tiny hamlet situated off the beaten track, near the village of Witheridge which lies on the B3137 between Tiverton and South Molton. 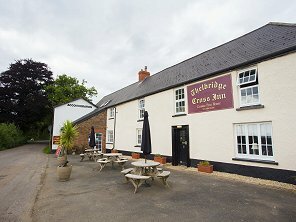 Thelbridge is made up of mainly farms and a few scattered cottages, and the Thelbridge Cross Inn is at the heart of rural life here.